Offers 365 short readings from the famous Transcendentalist who elected to spend two solitary years in a cabin overlooking Walden Pond. Explores topics as diverse as nature, society, politics, philosophy, ethics, education, religion and social justice. Readers can use this daybook as a spiritual practiceóone that promotes a life of simplicity, conscious living and quiet contemplation. A recognized expert on Thoreau, Andrews is minister of religious education at the UU Congregation at Shelter Rock in Manhasset, NY. 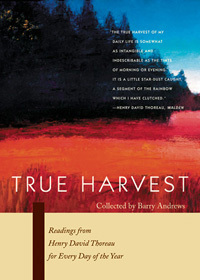 Andrews is the author of Thoreau as Spiritual Guide, Emerson as Spiritual Guide, and editor of A Dream Too Wild: Emerson Meditations for Every Day of the Year. The selections chosen for this collection reflect the broad range of Thoreau’s interests, and they are taken from the whole of his writings—his letters and journals as well as his lectures, essays, and books. Preference has been given here to longer passages in which he develops a thought and sees it through to its conclusion. Sublime and volatile truths, these passages are intended to be read and reflected upon as meditations for each day of the year. Thoreau is sometimes criticized as a solitary mystic who preferred a life in the woods to active engagement with the world of his time. Nothing could be further from the truth, as many of these words will reveal. Thoreau realized that spiritual growth does not take place in total isolation and that social, economic, and political conditions affect us all. In Walden Thoreau tells us that he desires to wake up his neighbors. It is not his intention that people should adopt his mode of living, he writes. They should find and pursue their own way, not their father’s or their mother’s or someone else’s. He means to be provocative, to be “extra-vagant,” to wander out of bounds, as it were. Thoreau summons us to the spiritual life. He is a wake-up call to greater awareness.